After a little over a week at the dock, taking care of everything from remaining rigging to another tidbit of wiring, a couple of days ago we got to see the sails actually move the boat. 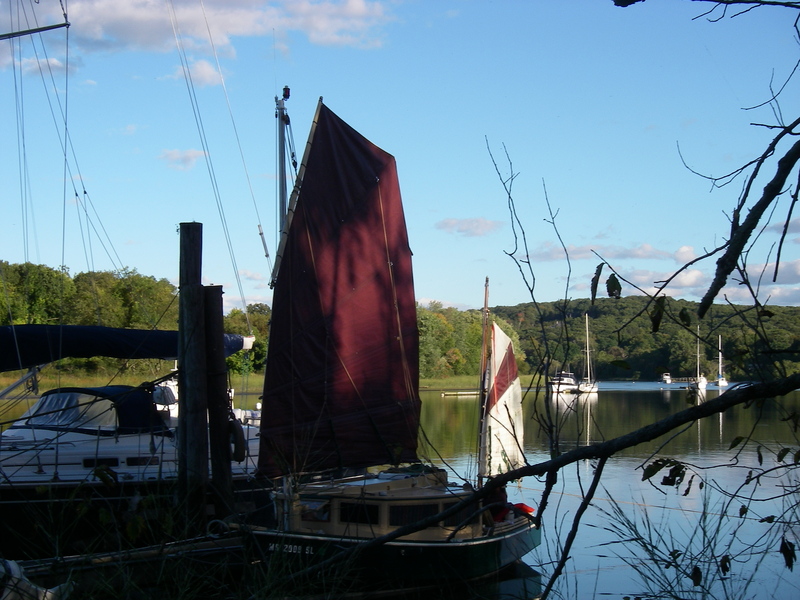 Systems were tested, challenges found, and after that little sail the night was spent anchored in back of Eustasia Island, about a half a mile down the river from Warren’s dock. 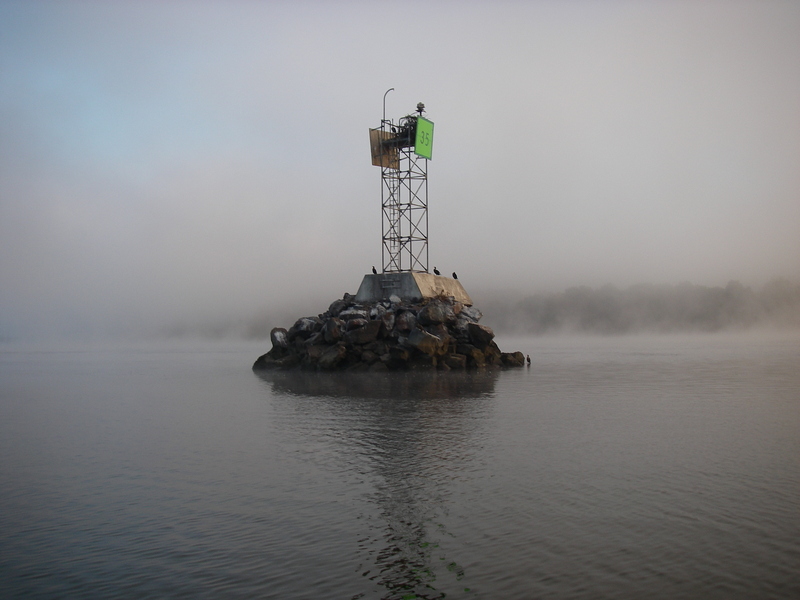 The following morning, early to catch the last of the outgoing tide and the morning north wind, we had rig test number two. 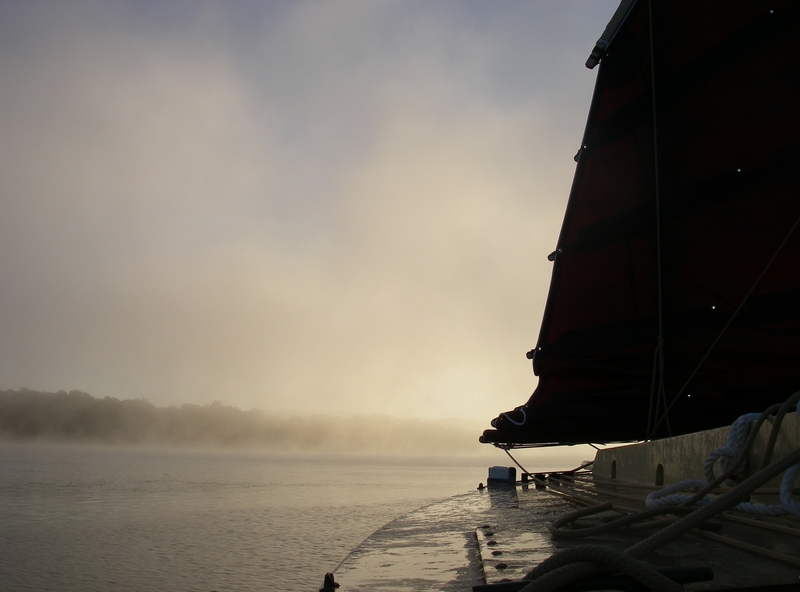 And, most importantly, a beautiful sail in the morning mist. For those in suspense about the minimal camber in these sails, I’m happy to say that the boat does indeed sail upwind, rather nicely, so far. Better than I was doing with the Paradox mainsail, at least it seems that way at this point. I’m going to have to try more upwind work with no current, to be more sure about it. Surprises on that first day, in the very light wind and bit of current, were issues with steering. The shifting tiny wind on the now much larger sails was often not enough to move the boat fast enough for the rudder to work well on the water, but it was enough to shift the orientation of the boat dramatically. I was glad there was no traffic. I had the pleasant company of Warren and Margo, and they were very good-natured about our various pirouettes, gradually riding the current north, and then after the tide changed, back toward the dock in Deep River. Funnily enough, Warren and I met originally because of another steering problem after the very first launch of the boat in 2012. Like in this new test, my understanding of how the sails were working together was a work in progress, and the small trolling motor that I had at that time was not enough to overpower the tight mizzen sail, which should have been released at the first sign of steering distress. As it was, in that first launch 2 1/2 years ago the boat wanted to go only in a straight line, perpendicular to the opposing wind and current, and only good luck with quick anchoring prevented sailing broadside directly into Warren’s docked boat. (His boat is an enormous steel sailboat, so is fortunately well defended.) After that experience we got the Torqeedo, and I started to understand how to manage a yawl rig. The other day, with Warren here in this very same boat, and the new junk rig, we once again had issues with ineffective steering. This was true while sailing in very light wind, turning unintentional circles, and then again having dropped the sails and having direction-holding complications while motoring to the dock, after the wind had picked up a little. Like two and a half years ago, it was again wind against tide, this time with the complication of all the new windage from the furled mainsail in the bow. On the bright side, I could be looking at this situation as an opportunity to embrace motorless sailing, including for docking in complicated situations. At least if the sails are up, once you understand their mechanics you know what they are up to, and with any breeze at all you have considerably more power than comes from a very lightweight motor. Another alternative would be a motor with more torque, and effective reverse – perhaps the next size up of Torqeedo, the 2.0. The Torqeedo I have now (the 1003) has an extremely stiff locking tab to hold the motor down – it’s virtually impossible to lock and unlock, so I leave it in its unlocked position. This is fine for gentle reversing out of a slip, but with that lock unsecured, doing any kind of heavy reversing causes the motor to tip up, creating all sorts of havoc as well as not doing the job at hand. My present understanding of the docking issue, with all the windage and resulting steering problems, is that one would need to come in with more speed so the boat had better steering, and then be able to use reverse to slow the boat in a short distance. Of course, if I was a truly elegant boat handler, the thing to do would be to understand all the forces, working with what the boat wanted to do, and place it in such a way that all that windage would be used to advantage, moving the boat into its desired location. I’m studying on that. Further thought on the unintentional pirouettes while sailing has led me to the hypothesis that this is the result of my tinkering with the sail area. This makes boat designers crazy – people start messing with designs and then are unhappy when there are completely unexpected results. My present guess is that putting so much sail area on this hull – a good bit more than the original design, and a lot more than I had with the Paradox rig – does not work well together with the designed keel and rudder. The boat becomes like a dry leaf falling from a tree through swirling winds, going this way and that with not enough shape under the water to provide direction against that large spread of “leaf.” I think that in a consistent tiny breath of air there would probably be no problem. This issue is not the boat’s fault – after all, I’m the one who went and put on all that extra sail area. Counterintuitively, the solution is probably reefing for tiny, shifting light wind, particularly in combination with complicated current. In that first test the other day, the tiny air movement was shifting direction, and on top of that the current was doing different things in different places, as the river came back together after flowing past an island. Having no effective steering was an odd sensation – this was not my experience with this boat in extremely light winds, once I had come to understand the yawl rig and how to manage it. In fact, this boat did a very nice job of holding its direction in tiny wind. Thinking on the leaf example, my new plan is that I will indeed try reefing the sails in those conditions of minimal and changing wind, especially when combined with shifting subtle current. The large sail area may very well come into its own on the open water in very light wind, where the air movement holds its direction. It’ll be interesting to see. On the second morning, there was no problem steering. The mainsail had only four panels up, instead of six, and the mizzen sail had five panels instead of six. The breeze was very light, but enough to riffle the surface of the water (unlike the previous tiny wind test, when the water was mostly glassy). Again we were traveling with the current, and there were occasional swirls. It was both peaceful, and satisfying. A rainstorm with northeast wind was predicted for the next day after that, so my destination was a side creek off of the river about 5 miles south from where I had just spent the night. This creek is particularly well sheltered from the northeast, and is quite pretty, with some very interesting bird activity. I was pretty set on getting there. Leaving first thing in the morning from the back of Eustasia Island meant that there would be favorable current for a couple of hours. 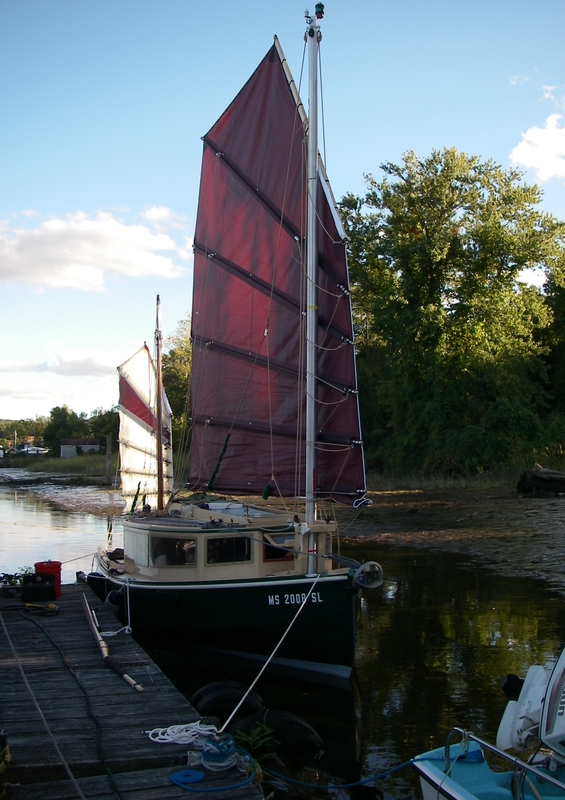 If the northerly wind picked up, it would then be possible to sail against the beginning of the flood tide. As it turned out, it was a very pretty sail, but that increase in wind didn’t happen. A little over a mile short of my destination the current started to get going in the other direction, and with progress diminishing, I turned into another side creek that I had always wanted to explore. It was perfect as a place to wait for the next ebb tide, though unfortunately likely to go to mud flat when that tide went out, or I would have stayed; with so much already happening, testing the new beaching legs was more than I wanted to take on. One day in the future I’d like to go in there with the right timing for low tide to investigate if there’s a little deep spot somewhere – because there’s so little water, there is no activity in there, and it’s quite peaceful. This is in back of Nott Island, across from Essex, Connecticut. As it was, by early afternoon when the tide was running out the wind had picked up from the southeast. This means a lot of tacking to go south in this part of the river, but with the current helping it’s not so bad, and interesting to weave in and out of the huge mooring field at Essex, with a number of elegant traditional sailboats to see along the way. The wind came up some more, which was particularly good from a sea trial perspective. I’m happy to say that the boat sails quite nicely in those conditions with the new rig. Particularly noticeable is that it tacks comfortably, settling in on the new heading without a lot of falling off, which has often been an issue. Perhaps this good behavior had to do with the current, but I’ll be especially pleased if it continues generally. 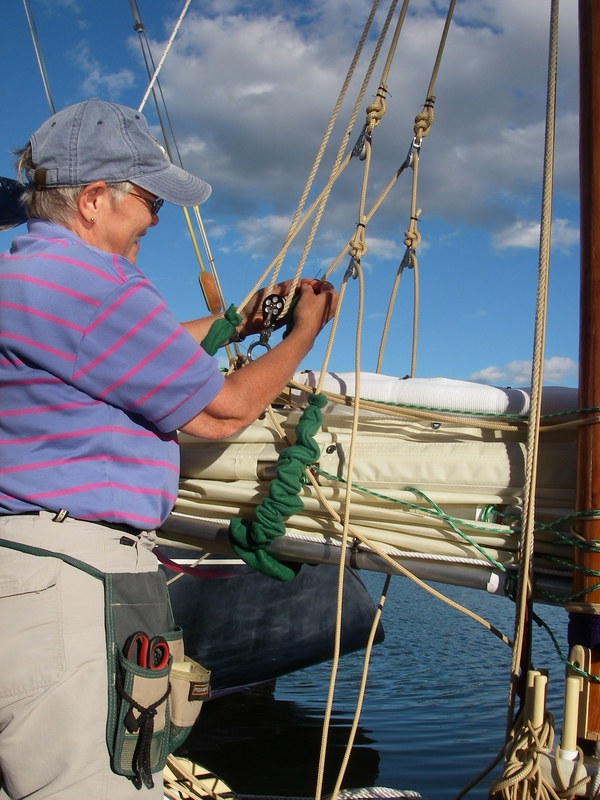 During the interlude at Nott Island I had the opportunity to make adjustments to the mast lift and lazy jacks. They had been set quite low in order to allow for full raising of the mainsail, but I had neglected to take into account just how fully that low boom and overall sail would block visibility from the cockpit. Coming down the river in the morning, with the sail out wide to starboard, a lot of contortions were required in order to see forward off the starboard bow. Tweaking those lines was a big improvement, though it came at the cost of not being able to fully raise the last panel of the sail. Really, the new mast could’ve been another foot taller. 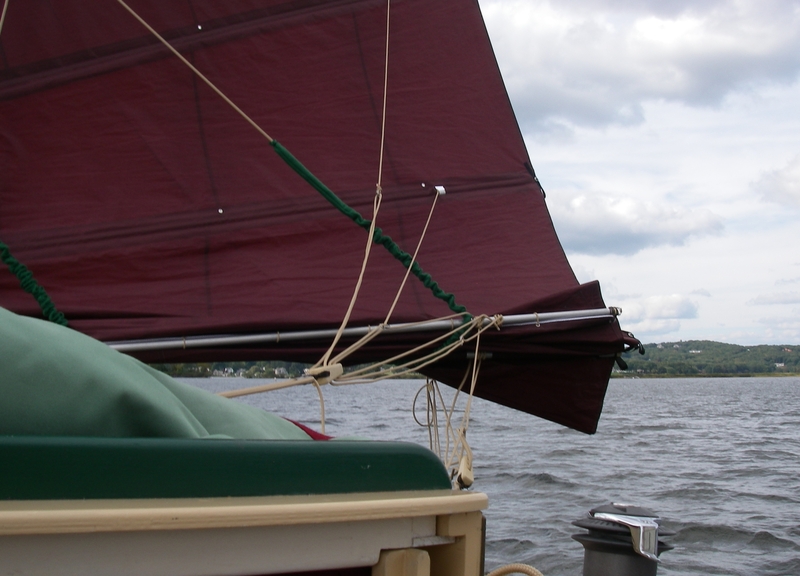 Or the new sail could have been made with boom and battens at 12 feet instead of 13 (boom/batten length determines the rest of the dimensions in the Reddish junk sail design process). Given the steering experience discussed above, the slightly smaller sail dimensions would probably be ideal, but I’m still pondering on this. As it is, with one or two panels reefed the boat still has a lot of sail area, carried lower… maybe that’s okay too, nicely filling the space above the cabin. Conventional wisdom says that it’s better to have a certain amount of height, rather than a very broad shorter sail, to most effectively drive the boat, so we’ll see how it goes. 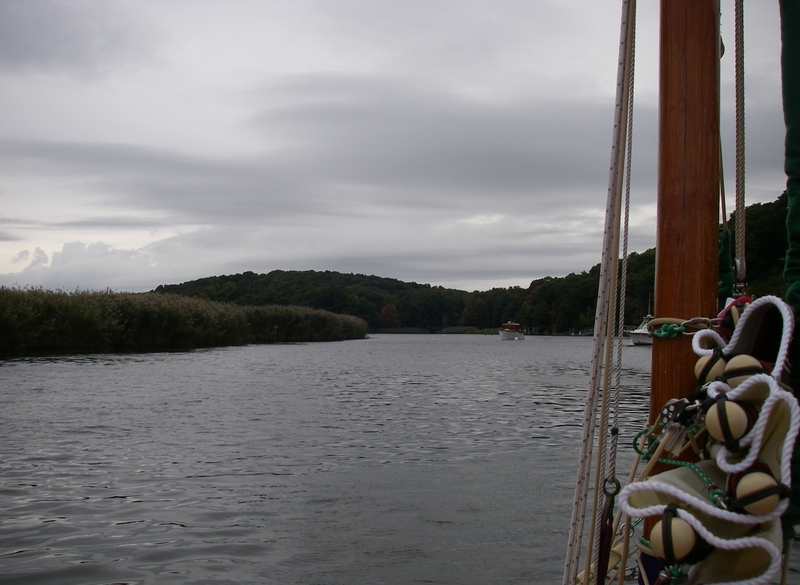 While we were sailing south, a big Nonesuch catboat was tacking down the river, coming out of Essex with us having a good head start. They of course eventually passed us by, but I was impressed that it did take some time, and a number of tacks for both boats, before that happened. And that boat was under full sail. The wind was something like 12 knots – easy for a larger boat, but time for reefing in my world, though with some sacrifice in speed. Anyway, with that other boat for a measure, the new rig came out looking quite respectable. And that’s with AUKLET heavily loaded for cruising! By the end of the day I was snug in my creek, in back of Goose Island. 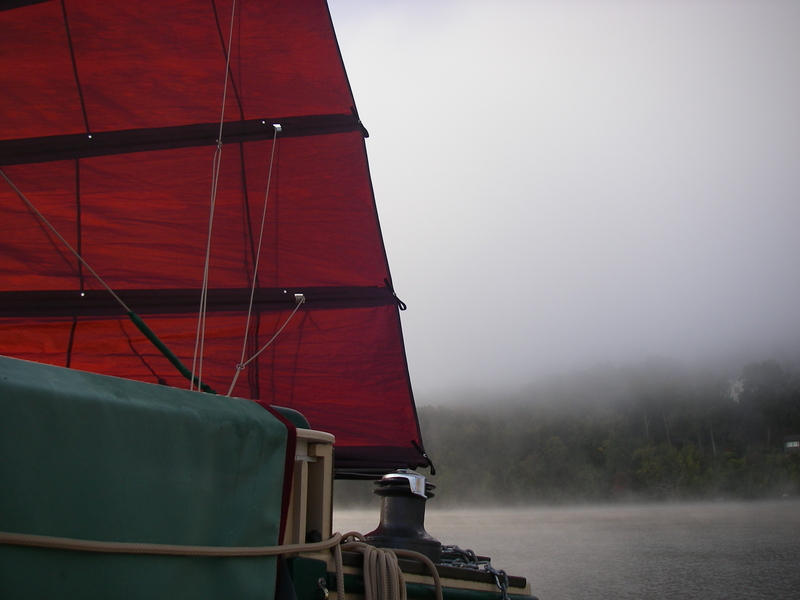 Further rigging adjustments are in progress, based on all the new information, and it’s perfectly beautiful watching the water, and the gentle rain, and the trees on the hillside just starting to turn toward their fall colors. I couldn’t be more pleased. “Loaded for cruising” sounds like much more than just working out the bugs! And from what I see on Google Earth, you’re doing some gunkholing a la Charles Stock & Shoal Waters. Have fun! Funny, about “loaded for cruising” – doesn’t seem to matter if it’s three weeks or three months, as far as packing. Maybe a little less food, but you still have three weeks of water, and the assorted gear to keep the boat secure and oneself. On the plus side, then you’re pretty much set for anything!